Paul has been serving refugees since 1985. He served with Operation Mobilisation (1 year), Slavic Gospel Association (3 years) and International Teams (15 years). He began serving with IAFR in 2010. Paul is an active founding member of the Refugee Highway Partnership in Europe. Having served as a pastor, Paul’s focus has been to help local churches to reach out to refugees in meaningful ways. He has helped empower and activate church-based work among refugees in several places around Europe including, Austria, Italy, France, Germany and the UK. Paul brings a holistic approach to refugee issues that are faith-based, person centered and relevant. He has come alongside of a number of refugee leaders over the years to strengthen and support them in their own efforts, including refugee leaders from Croatia, Kosovo, Iran, Iraq, Afghanistan, Syria and several parts of Africa. Paul is particularly interested in helping refugees to overcome some of the cross-cultural issues they face. 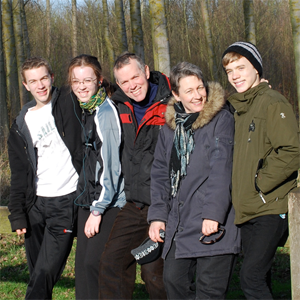 Paul and his family live in northern France. His wife, Reinhild, is from Germany. Their three teenage children (Tessa, Noah & Luke) have been raised in 4 European countries. Our Mission—We help asylum-seekers and refugees survive and recover from forced displacement in Lille, France. In addition, we connect to other church communities in the region to build networks and raise awareness. Centre Update—Currently the Lille team is renting a small room as a temporary ministry space. In March 2018, the leader of the “France pour Christ” church plant in Lille contacted us to contribute funding toward the purchase of a church building. In return, IAFR will use space in the building as a ministry centre for asylum seekers and refugees. IAFR’s refugee work in Lille will be benefited in many ways by expanding its ministry into the church facility. It connects the team directly to a local church and it brings the cultural and administrative expertise needed for such a large project. Financial Commitment—Our goal is to raise $15,000 for the initial start of the centre. Thanks to our generous donors, as of summer, 2018, we have received $9,219.00. Next Steps—September thru December—help with basic renovation steps to make the building useable (new floor, roof, entrance doors, wiring, plumbing, heating, interior rooms). January – Begin ministry activities. Involvement & Need – Besides the financial contribution we would like to help with the renovation and we need work teams. Please contact paul@iafr.org about your involvement or interest in sending a work team, as well as any other questions related to the ministry centre.